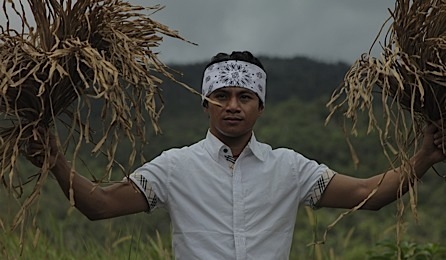 Reel Asian is co-presenting BUSONG on Friday October 21st, 5:00 pm at TIFF Bell Lightbox, Cinema 2. Reel Asian is co-presenting BUSONG at the imagineNATIVE Film + Media Arts Festival. Following a celebrated screening at the 2011 Festival de Cannes Directors Fortnight, awardwinning filmmaker Kanakan Balintagos returns to imagineNATIVE with Busong, his latest – and most breathtaking – feature film. Set on the beautiful Palaw’an Islands (home of the Indigenous Palaw’an people), Angkadang carries his ill sister, Punay, as they search for a healer to cure the wounds that prevent her from setting foot on the earth. The pair meet three individuals on their journey: a woman looking for her husband, a father who lost his son and a young man looking to find himself. Their lives intersect as each unexpectedly finds their “busong” (the Palaw’anon concept for “fate”). Stunningly filmed, Balintagos masterfully intertwines the characters’ stories with the landscapes that surround them to craft a film deeply evocative of his Indigenous culture. Please visit imagineNATIVE Film + Media Arts Festival’s website for more information.